Environmentally Friendly Moorings (EFM) is an initiative by Healthy Land and Water designed to protect seagrass meadows by replacing traditional watercraft moorings with an environmentally-friendly alternative. EFM’s ensure mooring chains are kept off the sea bed at all times, which protects seagrass and prevents damage to the sea floor. For the past 10 years, Healthy Land and Water has been involved in replacing traditional ‘block and chain’ moorings with EFM throughout Moreton Bay. Healthy Land and Water collaborates with mooring holders to replace traditional moorings with environmentally-friendly designs that don’t damage seagrass meadows. Currently, there are two EFM designs available. 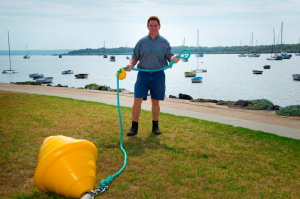 Both the Seagrass Friendly Mooring design and the Enviro Mooring design use a shock absorber apparatus that ensures watercraft are safely secured to the seabed and prevents the rope from dragging on the seafloor. A 3.8-meter long mooring post is screwed into the seabed as the anchor point. Attached to the mooring post just below the seabed is a set of load spreaders to stabilise the post. Then an “Aquatec” UV stabilised marine grade riser is attached from the top of the anchorage at seabed level to the shock absorber located inside the specially designed surface buoy. A “hawser” or pick up line is then connected to the other end of the shock absorber. The Seagrass Friendly Mooring is installed and maintained from a boat fitted with a hydraulic auger drive. Mooring consists of a helix anchor and Eco Mooring Rode. The helix anchor is screwed into the seabed and is adaptable to almost any type of substrate e.g. sand, mud, etc. The rode is the shock absorber of the mooring. It offers high flexibility by using an elastic core inside the very strong rope. It allows the boat to move in surge and waves, without causing a continual shock on the anchor. These rodes have been bench tested to 33,000 lbs. The system allows for any buoy to be used on the surface. For many years, ‘block and chain’ moorings were the most popular way to secure a boat or watercraft. 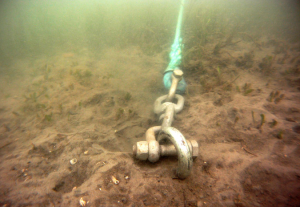 But ‘block and chain’ moorings – which often consist of makeshift anchors like concrete blocks or train wheels attached to a chain – are highly damaging to seagrass meadows. The mooring chain drags on the sea floor, ripping up seagrass and creating ‘crop circles’ that can be seen very clearly in aerial imagery. The EFM initiative is crucial because seagrass meadows form one of the most important marine habitats in our oceans. They provide essential habitat for many marine species and are a key food source for dugongs and green turtles. The meadows are also home to juvenile fish and crustaceans which are highly sought-after by commercial and recreational fishers. Since 2009, Healthy Land and Water has been involved in several successful trials to assess the effectiveness of EFM designs in locations throughout Moreton Bay. Starting in 2012, Healthy Land and Water collaborated with state and federal governments to design and roll out a mooring replacement program in priority seagrass beds to greatly reduce their impact on the marine environment. So far, more than 230 traditional moorings have been replaced within Moreton Bay, and more are scheduled to be replaced in the near future. The EFM initiative, which is delivered in close consultation with the state government, traditional owners, community group and the boating community, has been recognised with several awards including the Australian Business Award for Environmental Sustainability. Healthy Land and Water is working with the Gold Coast Waterways Authority (GCWA) to replace existing block and tackle moorings located within the Gold Coast section of Moreton Bay Marine Park. Currently, Healthy Land and Water is able to replace a limited number of existing block and tackle moorings with EFM designs at no cost to mooring holders within the identified priority area. To enquire about the program contact Healthy Land and Water Project Coordinator Rachael Nasplezes on 0459 213 477.